This is one of the newer Wm Britians line "American Civil War" #17862 Union Infantry Standing Firing #1 54mm Metal Soldier. This is an example of a new and even higher standard of quality from this grand-daddy of all toy soldier manufacturers. look at the detail on this guy! The sculpting, detail, animation, anatomy, and painting are absolutely superb. Put me down as a "Me likee". Does this amping up of quality have anything to do with the new First Gear Inc. ownership of Britians? as Michigander, and sets the bar pretty high. Funnily enough, he has ties to my home town of Oscoda, but that is another story. And, the sculptor for the Blue Coats line is also from Michigan. Once again, the Penninsular state leads the way! . Thanks for the insight Craig, "Tuebor" indeed! He seems to be drawing a bead on the connoisseur market. This soldier is incredible, though again the price puts it way out of my range. The only reson I was able to feature it was thanks to a friend who provided me with this loner. For as nice as the Conte figures can be, I think they are outclassed by Britians in animation, anatomy, sculpting, detail, and finish. Oh, and (I almost forgot) the "highness" of their prices. I think the company is called "Britians" because only folks in the queen's income bracket can afford these gems. BMC, that stalwart at the bottom of the plastic soldier food chain, maintains that position in the metal line as well. To say it suffers by comparison is understatement of the broadest sort. This is the metal "Irish Brigade" soldier made in China for BMC, yikes! Nice base. I didn't know that they had linoleum during the Civil War. How this Kewpie-doll managed to grow a mustache is beyond me. The khaki trousers were a real attention-getter, not to mention the eyebrows. Although I prefer my metal toy soldiers finished glossy, like this one, I need them to at least bear a passing resemblance to reality. "Made in China", if you get my drift. Note the warning on the highly-collectible box. Not for licking, swallowing, or other consumption by children under 3. "Mommy, I'm dizzy again!" "Mommy, Billy's fingernails are blue." Now, in fairness to all parties. These fine Britians are hoity-toity "miniatures" not intended to be enjoyed by the masses, the hoi poloi, children, and, in other words, me. Any soldier that can't actually be played with in the dirt is of little interest to this writer. And the suckiness factor of BMC figures (which is very high) is moot when you consider the price. You can't beat BMC's prices for sheer numbers of troops. When your factories are in China (I didn't say anything about slave-labor or Walmart here, that's just you jumping to conclusions) you can keep that price point low, low, low and the consumer happy. Like mom said, we all have our strengths. If you can't get them dirty, you can't play in my yard. Now speaking of BMC/Americana's buildings, they are not only very good in their own right but they convert well to other structures. Here's a the BMC/Americana version of the Widow Liester house at Gettysburg (Meade's Headquarters). I jazzed it up a little by lifting the corners of some shingles, glazing the windows, and giving it a nice weathered paint job. It's a small foundry or a large forge, definatley a workshop of some sort. The smokestack and hearth were made from wall panels from the BMC/Americana "Lee's Headquarters" kit. Similarly, the clerestory was salvaged from window panels from the Lee kit. I'm also working on a Pennsylvania bank barn that is made up of three of the Lee HQ kits... at six bucks a pop you can get a lot of them to use as raw materials. I'll be posting on that barn conversion another time. Dunker Church is one of my favorite places at Antietam National Battlefield. This one came by the Visitors Center with it's creator Ron Freese of Greenwood Indiana. Now, generally, I'm a 54mm guy, but this 1/72 scratchbuilt model of Dunker Church was too good to pass up showcasing on this blog. Complete down to the last floorboard and chunk of firewood. Thanks for sharing such a delightful model Ron. What a disappointment. After waiting nearly two years for this offering, the let-down matches the build-up. Here BMC/Americana had an opportunity for a fantastic product launch, one with an eager market hoping that their new Parrot gun and figures are reflective of some new corporate commitment to better sculpting and exciting new products. Alas, the Irish Brigade has advanced into action only to be revealed as simply their same old, tired, poorly cast, flash-ridden, lackluster Union soldier figures, this time molded in green plastic. Same old sugar, different bag, admittedly, a bag with a much more attractive hang-tag. Here's a great "Why bother?" moment. 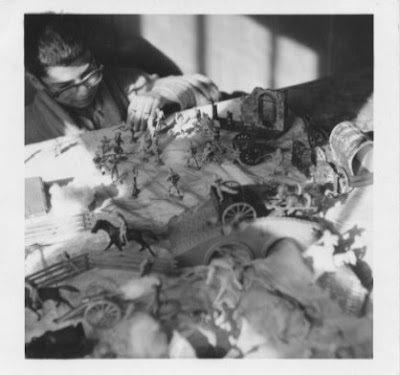 A lost opportunity for BMC/Americana to climb out of the quagmire of the lowest echelon of toy soldier manufactures and start a slow but steady climb toward improved quality. Examine the kepis, noses, beards, collars, and equipment straps of these two figures, one is a "new" Irish Brigade soldier and the other is just the old BMC running Confederate...clearly they are two different sculpts. Now look at this, two different sculpts OF THE SAME FIGURE! What was the meeting like on this one? It simply takes my breath away. But back to the Corby and Meagher figures. The sculpting of these two new figures is head and shoulders above the rest in the set, leaving one to ponder how delightful it would have been if all of the Irish Brigade figures reflected this new attempt at better sculpting in the BMC/Americana studios. Cast in brilliant green, father Corby is posed giving final absolution to the troops prior to battle. a faithful copy of the Corby statue at Gettysburg National Military Park. This astride figure of General Meagher, with the ground his men covered at Antietam in the background, is similarly well sculpted with simple yet effective detail. The sword is a quantum improvement over last year's BMC/Americana release of blue and gray cavalry troopers (which will be profiled sometime in the future). 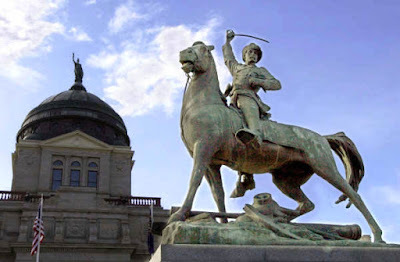 Again, this figure is reflective of the equestrian statue of Meagher on the grounds of the Montana State house, prompting one to wonder; "if not for statuary what would the sculptors at BMC/Americana do for inspiration?" looking somewhat puffy, perhaps too much salt pork in his diet. Nothing to write home about, but at least something new. Aside from these four anomalies the rest of the figures are the same old thing that we've come to expect from BMC/Americana figures. Curiously, BMC/Americana choose to mold artillery figures (sadly, their earlier generation) in green to include with this infantry brigade. What, do you suppose, is causing this company to be so complacent in such a dynamic and competitive market? with ersatz reinforcements, straight from the People's Republic of China. And face it, poor sculpting or not, we can always use more skirmishers. Finally, this point I've raised before. The BMC/Americana bottom line for me is the price. If you're just looking for new recruits to fill out depleted regiments, these conscripts are very cheap and plentiful. And sometimes, in the great plastic grinder that is pretend war, numbers trump quality. As the manpower-strapped Abraham Lincoln said with the 1861 arrival of the first western troops to Washington DC; "Thank God for Michigan!" So might a 54mm Lincoln in similar straits shout "Thank God for BMC/Americana!"